Every teenager in the world are aggressive to go on a trip. They want an adventure like in the movie "Stand by Me", and Japanese teenagers are also the same. I would like to introduce the kind of bicycle trip which many Japanese high school students enjoy in vacation times. In Japan, bicycles are more popular than in America. Everybody uses them to go to school, shopping, etc. So the roads in Japan are made for bicycles to ride easily and safely. I live in the south of Osaka, and this time I went to Nara with my bicycle. 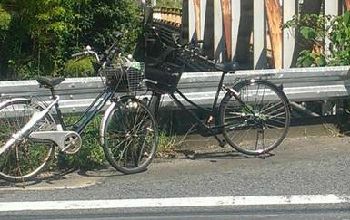 The bicycle on the left side of the picture is my bicycle, and the black bicycle is my friend's bicycle. First, we went to Houryuji. 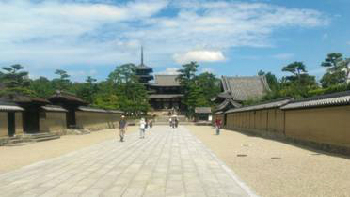 This temple is the oldest wooden building in the world, and there are many famous statues. Some of the statues are designated as Japan's national treasures. My friend and I didn't have any money to enter the museum, so we just took pictures and left the temple. But looking at the huge temples was an amazing experience. My friend and I got hungry, so we cycled around the town and found a cheap Japanese food shop. I ordered noodles called "Cha-soba". 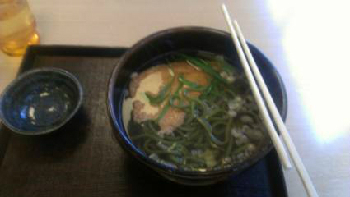 This soba is different than other soba because it has green tea inside the noodle. So the noodle is colored a beautiful green, and that makes you want to eat more. After we ate lunch, we cycled to Toudaiji. Toudaiji is famous for the huge Buddha statue inside the temple, and the height of the statue is more than 15 meters. As you can see in the picture, there were many foreign tourists and the staff of the temple were having a tough time explaining to the tourists. Unfortunately, we didn't have any money to go into the main building of the temple. This is the fate of our cheap bicycle trip. 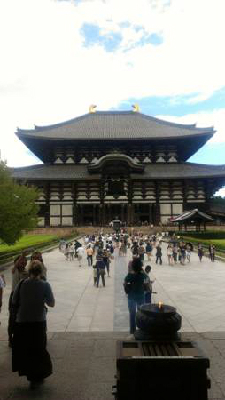 Toudaiji is located next to Nara Park. 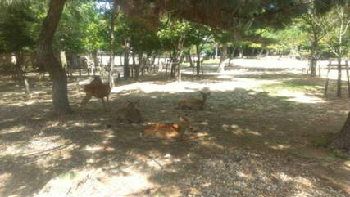 Nara Park is a giant park, and many deer are grazing freely here and there. These deer are always starving and draw near to (or attack) tourists who have something - anything - to eat. Not every deer in the park is aggressive to get their rations. Some deer rest in the shade, with a dull face. As we were cycling, we happened to meet this heartwarming scene. They were awfully CUTE!!! The reason for doing this bicycle trip is because it is easy to break up the journey. You can explore narrow roads or mysterious buildings. The sights you can see from the bicycle are fantastic and make you excited. Well, the real reason for doing this trip is because it is cheap!! Cheapness saves high schoolers' wallets!! And the memories that you get on the trip are... priceless!! Child Research Net would like to thank the Doshisha International Junior/Senior High School, Kengo Nemoto, student and author, for permitting reproduction of this article on the CRN web site.